“Between 1965’s Maiden Voyage and 1968’s Speak Like A Child, Herbie Hancock was consumed with his duties as part of the Miles Davis Quintet, who happened to be at their creative and popular peak during those three years. When Hancock did return to a leadership position on Speak Like A Child, it was clear that he had assimilated not only the group’s experiments, but also many ideas Miles initially sketched out with Gil Evans. Like Maiden Voyage, the album is laid-back, melodic, and quite beautiful, but there are noticeable differences between the two records. Hancock’s melodies and themes have become simpler and more memorable, particularly on the title track, but that hasn’t cut out room for improvisation. Instead, he has found a balance between accessible themes and searching improvisations that work a middle ground between post-bop and rock. I asked him for specifics, “What I was into then, and have been thinking about more and more,” Herbie answered, “was the concept that there is a type of music in between jazz and rock. It has elements of both but retains and builds on its own identity. Its jazz elements include improvisation and it’s like rock in that it emphasizes particular kinds of rhythmic patterns to work off of. “This album,” he continued, “also is an extension of Maiden Voyage in terms of my use of simple, singable melodies, Now what’s different in Speak Like a Child as a whole has to do, first of all, with harmony. For the most part, the harmonies in these numbers are freer in the sense that they’re not so easily identifiable chordally in the conventional way. I’m more concerned with sounds than chords, and so I voice the harmonies to provide a wider spectrum of colors that can be contained within the traditional chord progressions. In much of the album, there are places where you could call the harmonies by any one of four designations, but no one designation would really include everything involved. That’s how I write; that’s how it comes out. Herbie also points out that “Speak Like A Child” is a sectional piece, and has no definite tonal centers. It should also be noted that the attractive young lady on the cover is Herbie’s fiancee, Gigi Meixner. On January 13, Herbie, Wayne and Ron entered the studio to record a date with Lee Morgan. Standards (CDP-23213), remained unissued until 1997, but upon its release added to both Lee’s vast Blue Note legacy and memorable Hancock solos. March 20 found Herbie in the studio again as a sideman on Wayne Shorter’s Schizophrenia (BN-84:297), with Ron and Joe Chambers. Herbie’s solo on “Miyako” is a treasure. Miles then took the Quintet on a West Coast tour, to climax at the Berkeley Jazz Festival (On April 7). The Berkeley concert was incredible, with Albert Stinson now on bass. The group was now beginning to burn like before, and Herbie was starting to add touches of his post-Miles style. After working two weeks at Shelly’s Manne Hole at the end of April and early May (with Buster Williams on bass), Miles went into the Columbia Studios in Hollywood on May 9 and recorded a single track “Limbo,” which was eventually released in 1979. When the Quintet returned to New York, Miles decided to remain in town and book the Village Gate as a home base. For the months of June July and August, Miles would rent out the basement club and promote his own concerts. This gave Miles a rest and Herbie became available for sessions. Little did he know that he was about to embark on an unprecedented series of recording sessions. From May 16, Miles went into the studio seven times. The albums Sorcerer, Nefertiti and Water Babies were issued from these sessions. During June, Herbie participated in Wes Montomery’s hit A Day In The Life (A&M-3001). Lee Morgan went into the studio on July 14 to record another Blue Note album. On the date was Wayne, Herbie, Hutcherson, Ron Carter and Billy Higgins. The album was eventually released as The Procrastinator (BN-LA-582) in 1977. Just five days later, on July 19, Herbie, Wayne and Ron finished Miles’s epic Nefertiti album (Columbia CS-9594). To hear the full depth of Herbie’s style, compare the two recordings. For Miles. Herbie plays in a style unique to the Quintet, but for Lee, Herbie gives the date a classic Blue Note feel. What musicianship! Just two days later (July 21) Herbie played on a quartet date with Bobby Hutcherson, that, strangely enough, was never released until 1979. The album is called Oblique (GFX-3016), and it is quite possibly one of the finest recordings in jazz. With Albert Stinson on bass and Joe Chambers on drums, this sessions literally redefines sensitivity and sophistication. Herbie’s “Theme From Blow-Up” was recorded at this session, and is included in this box set to showcase the composition and this incredible performance. During August, Herbie recorded Harold Vick’s The Melody Is Here (RCA-3902), and the high spots from these sessions are three quartet performances with Harold Vick, Harbie, Cranshaw and Grady Tate. “If Ever I Would Leave You” has a great Herbie solo. In the fall of 1967, Miles took the group out of town again, and the band was on the West Coast. The band set house records at the Penthouse in Seattle, and eventually ended up in Los Angeles. The band returned to the Village Gate in October for a couple of weeks before heading for a two week tour of Europe organized by George Wein. Because of the relationship between the Concerts and European radio and TV there are many verite recordings of this tour that are available. You can hear the band about to explode, and Herbie feeds the fire. His style with Miles was unlike his albums on Blue Note. When Miles went back into the studio on December 4, the sound of the band expanded for the first time. Herbie played celeste. The track was Circle In The Round (Columbia KC-36278) and was the start of Miles’s crossover period. At the end of the month, on the 28th, Miles went into the studio and recorded “Water On The Pond.” These sessions were kept in the can and only released in 1979 and 198O. Also in December, Herbie recorded with Cal Tjader (Hip Vibrations) and Kenny Burrell (Blues The Common Ground), both for Verve, and reunited with Wes Montgomery for Down Here On The Ground (A&M 3OO6). On the Tjader date, Herbie connects with Ron on Django. As with most sessions for Creed Taylor, who was hiring Herbie whenever Herbie was in town, the final album might take two to five sessions over two months. The Burrell date, the Montgomery date, and sessions for Artie Butler (Have You Met Miss Jones? ), George Benson (Giblet Gravy), Kai and J.J. (Israel) and the Soul Flutes (Trust In Me) kept Herbie busy January and February of 1968. Herbie was on 12 sessions on those two months, not including the Miles Davis sessions, which he squeezed in. Miles Davis’s Miles In The Sky was the first album to feature Herbie playing the Fender Rhodes electric piano. The sessions from January and February show the band in disintegration, but conceptually heading for the future. “Side Car,” “Sanctuary,” “Fun,” Herbie’s composition “Teo’s Bag” (aka: “The Collector”) and “Paraphernalia” were outlining the next step. On January 25, 1968 Herbie brought in two new compositions for Miles to consider. These versions of “I Have A Dream” and “Speak Like A Child” show that Herbie was beginning to break the musical bonds of Miles Davis and go in a direction that was all his own. The harmonic demands of Herbie’s new music were a bit too much for Miles, who preferred his music simplified. The Quintet could not get the vibe Herbie was reaching for, and this music was left in the vaults. These rehearsals were finally issued on the Complete Studio Recordings Of The Miles Davis Quintet: 1965-68 (Columbia). After finishing up studio sessions for Verve and A&M, Herbie went back into the studio for Blue Note this time as a leader, the first since the July, 1966 funk session. Herbie owed Blue Note a lot of records, but his constant travel and the difficulties of actually putting together recording sessions made his studio output as a leader less frequent than Blue Note may have wanted. The alternate takes from these sessions were chosen for two reasons; they represent a work-in-progress view: how musicians create a memorable performances from the continuity of earlier takes, and the fact that any Herbie solo is worth hearing. “Riot” clearly demonstrates this model. The first alternate take (take 1) shows the ensemble not quite blending on the melody statements, and by the second alternate take (take 4) you can hear the group jell. The master take of “Riot” is fully defined and flawless. Yet in the earlier takes, you can hear Herbie go for it in a way that he didn’t go for on the master. The alternate take of “Goodbye To Childhood” is a lost gem. Hidden in the vaults for 30 years, this is Herbie’s first solo piano recording. After a brief ensemble introduction, it’s only Herbie until the band returns at the end. And what beautiful Herbie it is. His style was now at a turning point, and this solo shows us the new Herbie: harmonically complex, and filled with dense, polychordal voicings. And yet, with all of this complexity, the melodies themselves are hauntingly beautiful, and evocative of an individual view. 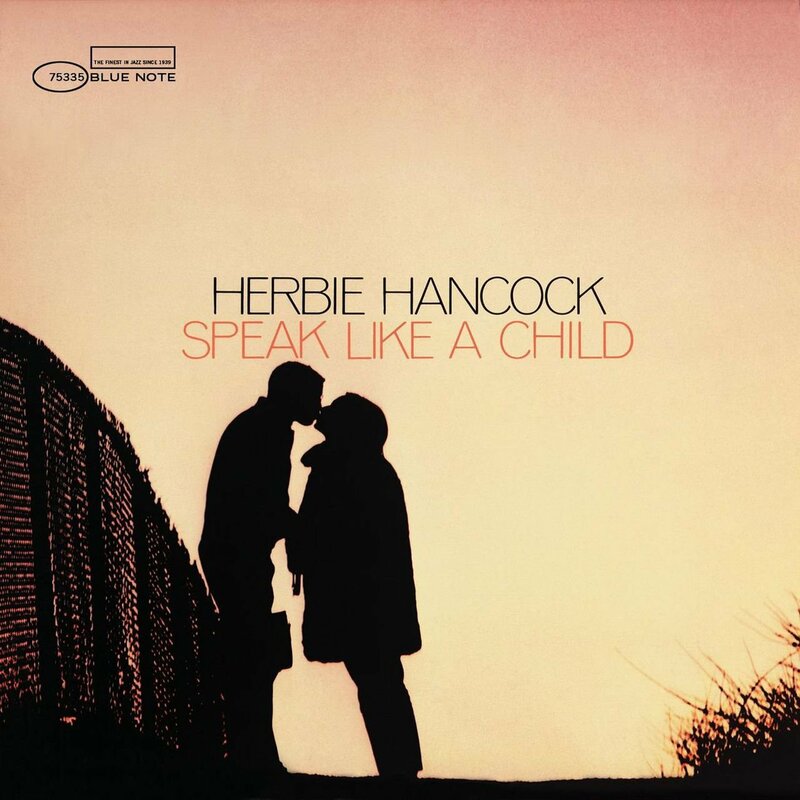 The album Speak Like A Child catapulted Herbie into the forefront of jazz composition. Meanwhile, he was still a member of the Miles Davis Quintet, and that had some drawbacks. The band was going through constant turnover on the bass chair, and the work schedule was determined more by when Miles wanted to work. Herbie rehearsed with Miles at his house before record dates, and recorded and gigged with him, yet by 1968, Herbie wanted to move on. In April, Herbie was on the West coast with Miles and the Gil Evans Orchestra. When Miles returned to New York, he went back into the Village Gate and again, Herbie was free to record. “I used to see Herbie on jingle and TV dates.” Phil Woods told me. “Herbie and Wayne one day, Herbie and Ron the next day. Sometimes we would work for these guys named Murtaugh, and they would hire the best jazz musicians in town to do Commercial dates. Herbie was on my album Round Trip (Verve).” Herbie was the first call for many arrangers, including Don Sebesky and Oliver Nelson. In May and June, Herbie recorded with Miles “Stuff,” “Country Son,” and “Black Comedy” to finish out the Miles In The Sky album. “Tout de Suite” (a rough draft) and the master takes of Fille de Kilimanjaro, “Petits Machin” and “Tout de Suite” were destined for the mind shattering Filles de Kilimanjaro album. These June sessions would be the last that Herbie would participate in as a member of the Quintet. In the midst of this tumultuous musical scene with Miles, Herbie also found time to record with Roy Ayers Stone Soul Picnic (Atlantic) with Charles Tolliver, Gary Bartz and Miroslav Vitous, (who had been subbing with Miles) and Grady Tate’s Windmills Of Your Mind (Skye). In July, Herbie appeared on Charles Tolliver’s Paper Man album (with Ron and Joe Chambers) and in August. Miles was still holding down weekends at the Village Gate during those months, with an occasional gig in Philadelphia at the Show Boat. Miles was going to take a European vacation in September and then get married, so there was no work for the Quintet. Herbie himself got married and went on his honeymoon to Brazil in September 1968. “I got sick, that’s all there was to it.’ Herbie said. “Jack Whitemore (Miles’s agent) called about some gigs, and I said I couldn’t make them because I’m down here sick…and he thinks I don’t want to do the dates.” The next thing you know Chick Corea is in the band by late September (for a week at the Plugged Nickel). Miles also recruited a young English bass player named Dave Holland, and voila!, the new Miles Davis Quintet was born. This development gave Herbie a newfound initiative to form his own group. With the music from Speak Like A Child (which had been released in September 1968) as his foundation, and with solid hits from the past behind him, Herbie was ready in a musical way to go on his own. In October, Herbie debuted his new sextet at the Village Vanguard. In the band was Johnny Coles on trumpet, Joe Henderson on tenor sax, Garnett Brown. On trombone, Buster Williams on bass and Albert “Tootie” Heath on drums. This group was a magical band, and would often expand upon the music, until an entire set would be comprised of just one song (shades of the electric sextet a few years later). Herbie also remained busy in the studios. In October, Herbie recorded an album for Paul Desmond (Summertime on A&M, arranged by Don Sebesky), on which Herbie provides one of the greatest performances by a sideman in support of an album. On October 14, Herbie joined back up with Stanley Turrentine in a big band setting arranged by Thad Jones (Always Something There BN-84298). More sessions followed into November, and Herbie found himself on sessions for J.J. and Kai (Betwixt And Between, A&M), Luis Gasca (The Little Giant, Atlantic) and back with Miles Davis for his first multi-keyboard session. “Directions,” “Ascent,” “Two Faced,” “Splash” and “Dual Mr. Tillmon Anthony” were recorded in November 1968. Miles was keenly aware of Herbie’s ability to work with other musicians, and Herbie and Chick Corea forged a musical bond playing together on these sessions that continues till this day. The session calls kept coming in: Milton Nascimento (Courage for A&M), Toots Thielemans (Toots for Command), Peter, Paul and Mary (!!) (Late Again for Warner Brothers) and an odd session for Columbia which ended up on a Christmas compilation (“Deck The Halls” from Jingle Bell Jazz) which featured Woody Shaw, Herbie and Chick Corea on Fender pianos, Al Caiola and Ed Shaughnessy. But his next session would be an important gathering of musicians, who would change the course of jazz history. On February 18, 1969, Miles Davis assembled Wayne, Herbie, Chick Joe Zawinul on keyboards, John McLaughlin on guitar, Dave Holland on bass and Tony Williams on drums to record. The resulting album, In A Silent Way (Columbia CS-9875) had a profound affect on jazz for years to come. The album announced, not with a bang, but with a feeling, the start of the jazz fusion movement. Highly influential, even to this day. In A Silent Way took both the musicians and listeners on a trip. Sessions continued in March with Roy Ayers (Daddy Bug, Atlantic) and an unissued session with Attila Zoller for Embryo. There’s nothing like flunking, picking yourself up and learning from your mistakes. That’s what Herbie Hancock’s story was in the mid-60s. After his 1965 Blue Note milestone, Maiden Voyage (his fifth for the label and most popular to date), Herbie decided to conjure up a funk-inflected album in 1966 with a nine-piece band. The only problem was that at the time he didn’t know much about funk, or rock for that matter (that would be rectified in 1973 with his Columbia Records funk-filled fusion Head Hunters album highly influenced by the likes of Sly and JB) and still considered himself a “jazz snob.” That project ended up on the scrap heap. The mid-60s was a busy time for Herbie, who was helping to pioneer new jazz ground as a member of the Miles Davis Quintet. Nevertheless he headed back into Rudy Van Gelder’s New Jersey studio in 1968 on March 3 and 9 to record Speak Like a Child, the long-awaited follow-up to Maiden Voyage. But in the almost three years since that release, Herbie had matured as a compelling pianist as well as an imaginative composer. He was being influenced by his Miles bandmates – tenor saxophonist Wayne Shorter and the dynamic rhythm team of bassist Ron Carter and drummer Tony Williams – and was also all ears to the orchestral arrangements of Gil Evans, Oliver Nelson and Thad Jones, with whom he performed periodically. As a result of the latter, Herbie enlisted three players – Thad on Flugelhorn, Peter Philips on bass trombone and Jerry Dodgion on alto flute – to color his tunes harmonically in lieu of sharing solo duties. In fact, neither Ron nor drummer Mickey Roker jump in with choruses either. Ron keeps the steady beat that undergirds the sessions and Mickey provides the drum drive. Happily there are no round-robin solo contests on any of the six tracks. Instead, it’s largely Herbie’s show to deliver his bedazzling frills and fancies on the piano. Though it’s hardly a one-man show, there’s much to be said about listening to this album by focusing on Herbie, who puts on a captivating-but never show-offy-performance. While Speak Like a Child shares a common lineage with Maiden Voyage in its infectious lyricism, Herbie was an evolutionary musician who was hearing music in a new and fresh way. His songbook for the session includes two tunes he had written that had become part of Miles’s setlist: “Riot” (instigated by the social and political turbulence of the outside world) and “The Sorcerer” (Herbie’s descriptor for Miles the enchanter) that bookend the album. Herbie plays buoyantly on the tracks that are swinging, skipping affairs. Another Herbie original, “Toys,” swings with horn/flute luminosity, with Herbie reflecting on the keys the riffs the trio of pastel colorists paint. The song dashes with the sensibility of a chase. This tune comes after the only non-Herbie composition, the bright and playful “First Trip” that Ron brought to the date. In a trio setting of piano-bass-drums, Ron’s bass is delightfully and importantly high in the mix, while Herbie sends up a sweeping flourish of notes and phrases. Originally recorded on March 6th (tracks #1-3, 7, 8) and March 9th (tracks #4-6, 9), 1968 at the Van Gelder Studio, Englewood Cliffs, New Jersey. Remastered in 2004 by Rudy Van Gelder. Tracks #1-6 originally issued in 1968 as BST 84279. Tracks #7-9 originally issued in 1998 on CD box set B2-95569. Note: Herbie Hancock’s 2003 performance of the song “Speak Like A Child”, which appeared on Harvey Mason’s With All My Heart album, won a Grammy Award in 2004 for ‘Best Jazz Instrumental Solo’.